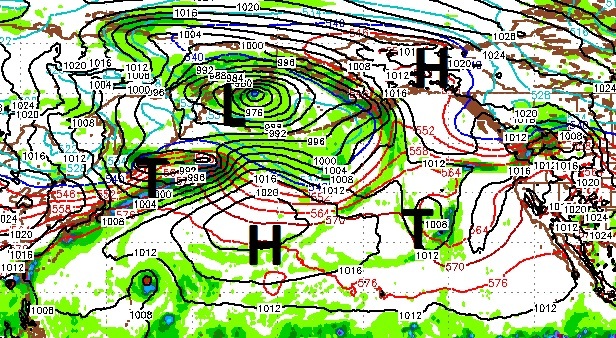 It does not take a meteorologist to figure out the path of the storm with the blocking ridge off the BC coast. Songda will hook up with a strong storm in the Gulf of AK and form a particularly large storm, especially for this time of year. Remember back to 10/13 of 2009. We had a similar pattern. A typhoon crossed the Pacific, picked up strength along the way and dumped in the Sierra. Mammoth picked up nearly 5 feet of snow and opened top to bottom on October 15th. This major weather event will be with us from Friday through the following Monday. A good old fashion Sierra storm. What is even more impressive are the precipitation amounts. 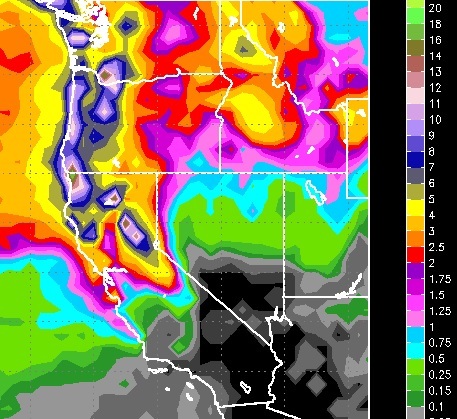 Many areas of the Sierra will pick up from 8-15 inches of liquid precip. 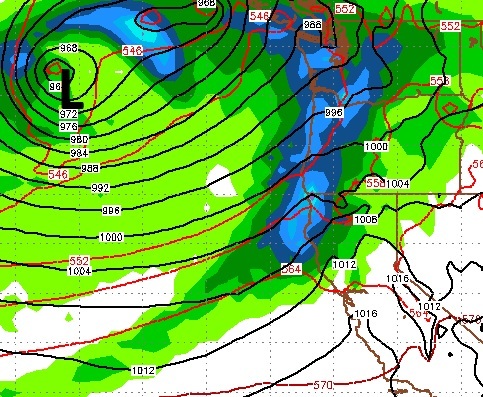 That could translate into 4-12 feet of snow (or more) especially north and west of Tahoe. I see the Carson range and Mt. Rose possibly getting up to 5 feet of snow by Tuesday morning! Snow levels will be all over the board as a series of short waves moves through the area. I think this is all snow, however, above 8,000 feet (could be wishful thinking). That number could move to as high as 10,000 feet and I will blog later in the week with more accurate predictions. 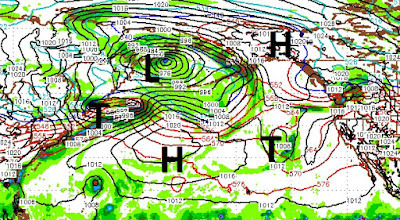 I do not want to get ahead of ourselves with a very active pattern late week coming up but I am seeing more extremely interesting weather arriving next Wednesday 10/19 or so. Its based on tropical storm Songda south east of Japan that is going to become a strong typhoon in the next 18-36 hours. The arctic oscillation now in strong negative phase and our southerly positive PNA jet stream should continue to transport warm occluded storms into the west coast. Nevertheless, this one could become embedded in a more zonal flow and swing in further south hitting Mammoth, Kirkwood and south lake compared to this series that is taking aim more at Northern California and Reno area. This progressive pattern I am seeing is nothing I have maybe ever see before in mid October and us Californians might very well see what almost the entire world has been seeing- rain amounts that leave your jaw dropped and river levels that seemed impossible to reach! Typhoon Chaba remnants are getting sandwiched between two lows and it appears its going to get torn apart and dispersed between the two. This scenario will bring less rain but could energize the troughs to bring a period of moist cool weather starting Monday night and becoming progressive in nature with the Wednesday night/ Thursday low being the strongest and most southern of the series. It looks like more systems but weaker may move into the northern Sierras over the weekend and to be honest i do not see much of a break or "Indian Summer" this year and could be one of those old school Tahoe Patterns we have NOT seen in a long time. Similar to the late 1950's if i was to choose a period but with a slightly warmer earth. * I am seeing a finger of atmospheric river starting to form above Hawaii (Pineapple Express) and from what i can see dynamic and teleconnection wise (weak el nino modoki) we could see a couple AR/PE events this year? Going to be interesting to see what unfolds and definitely not a drought pattern anymore! 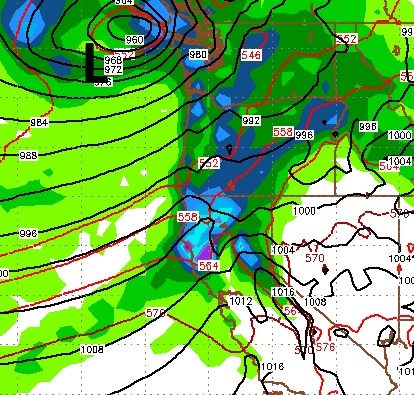 Could central and southern california see a lot of rain too this season. Looking pretty good at moment! PNA (check out Climate Prediction Center site and wikipedia if you want to learn more about this teleconnection) pattern in positive and looks very el nino like right now!! ENSO neutral would support this flow regime and MJO should move around more this year and not sit so stationary in far west pacific like last year deflecting the storms into the northwest. If the PNA pattern stays positive into December and MJO positions itself below Hawaii so cal could see some very strong pineapple express storms this year and they are way overdue down there!! Thank-you Paul for the exciting information. This site is dedicated to the skiers and riders who frequent the resorts and back country of Lake Tahoe. It is a long-range forecast website for the mountains and occasionally the valleys. We specialize on forecasting for the Carson Range, which is located along the eastern shore of Lake Tahoe.